Accor Hotels in Malaysia are welcoming guests to share their ultimate Malaysia experience and win a vacation worth MYR2012 at the participating hotels. Come and experience a memorable Malaysia journey, document the journey, and share it with others. The precious tale could now be worth a prize! The Accor group’s network hotels in Malaysia invite guests to recount their incredible journey in Malaysia to win a vacation worth MYR2012 of 3 days/2 nights stay in a suite for two at participating hotels including free breakfast and private city tour for two. Southeast Asia has a unique culture, tradition, cuisine, art and lifestyle. The amazing characteristics of Southeast Asia are all found in Malaysia, a country where you are likely to experience the trip of a lifetime. This proud Asian country features a variety of holidays for your tastes and budget. Whether going for an adventure in the jungle, relaxing on an exotic beach, exploring the city of the Twin Towers or shopping in the most renowned malls, Malaysia has it all. 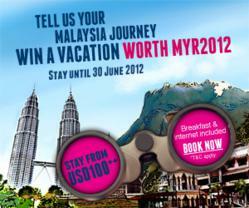 Accor Malaysia encourages their guests to share their wonderful Malaysia journey to the world and get a chance to win a vacation worth MYR2012. Participation is simple: book a Tell & Win package for any length of stay before the 31st of May 2012. Write a story about the wonderful stay in Malaysia including photos, then email the travel journal in a Word Document with details of full name, contact numbers and the name of hotel guests have stayed to contest@myaccormalaysiajourney.com before 15 July 2012. Shortlisted stories and the 4 winning stories will be posted on Facebook pages including Accor Indonesia, Accor Singapore and Accor Asia Pacific. The Tell & Win offer is valid for stays from 1 February to 30 June 2012. The offer includes accommodation, buffet breakfast and 24-hour internet access. Advantage Plus members enjoy an additional 15% off the public rate when booking this offer. Join Tell & Win now at participating Accor Malaysia hotels: Pullman Putrajaya Lakeside, Pullman Kuching, Novotel Kuala Lumpur City Centre and Novotel Kota Kinabalu 1Borneo. For more information about the offer and contest, please visit the Accor Malaysia Tell & Win offer page at Accor Malaysia website.